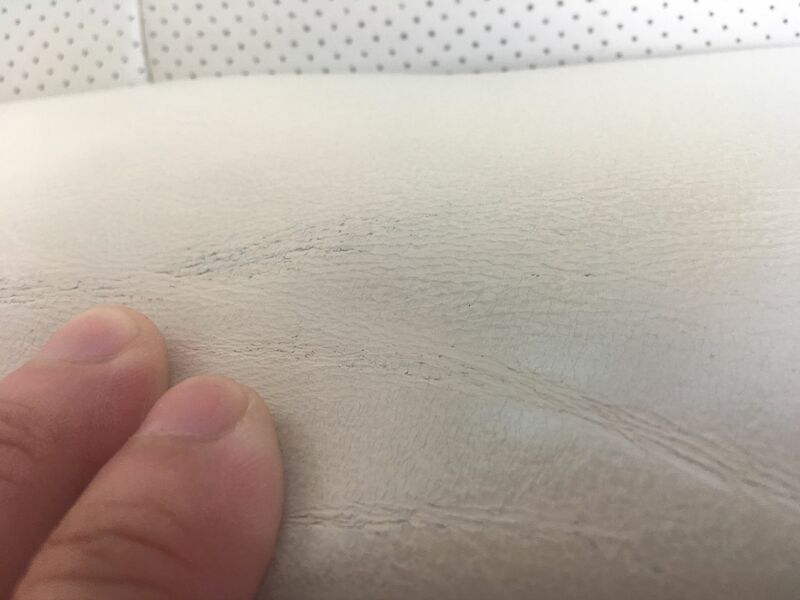 And there is one tiny spot where the new dye is flaking off, in the valley of a crease in the leather. 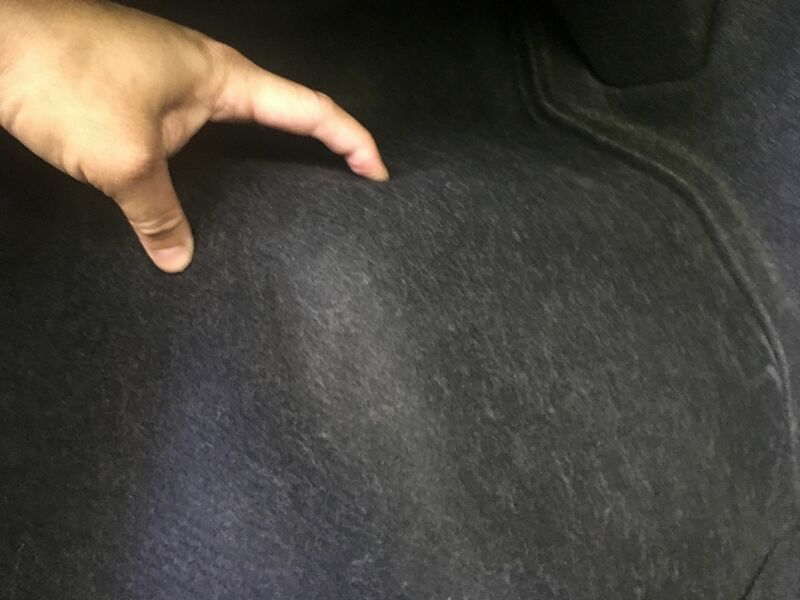 So I went to see Rob at PPPCo, who are the Leatherique importers and he suggested that the grubby part could just be the new dye being too thin, and it's exposing some of the old dye underneath. 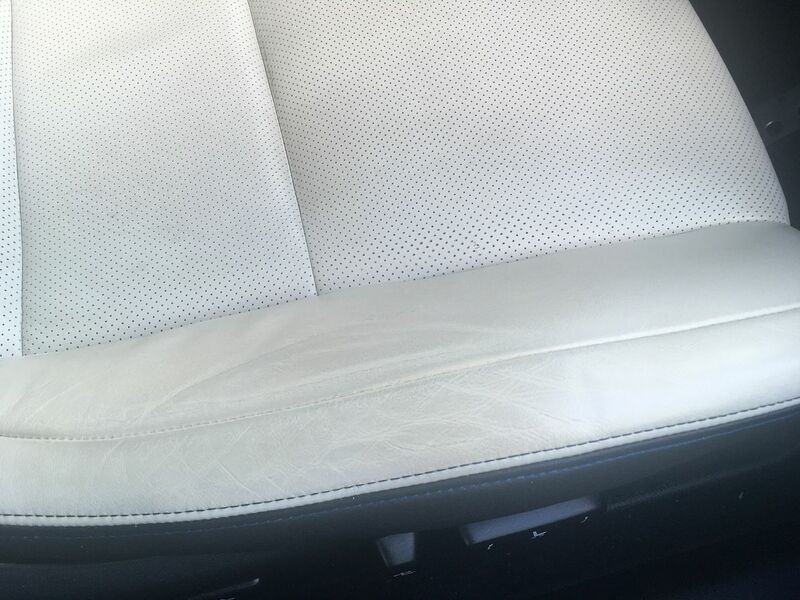 He also recommended that in the flaky spot, to really work the new dye into the leather with your finger, instead of gently wiping over it like the instructions say. He also noticed that the new dye was a bit more yellowy than the rest of the seat, so he offered to make up a new bottle of dye for me. And it's a much better color match. The other thing that happened recently, is that I've been chasing better handling and laptimes, and so we bought a thing. 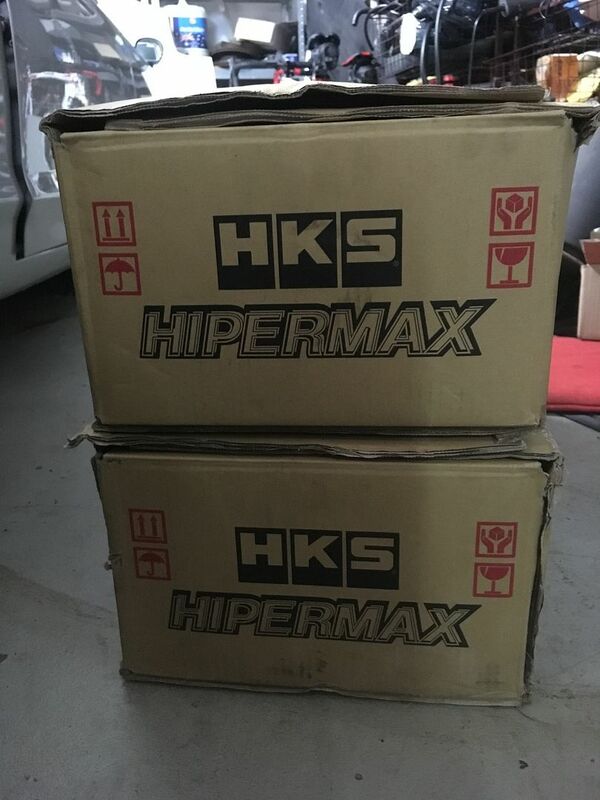 They're HKS Hipermax IV GT coilovers. 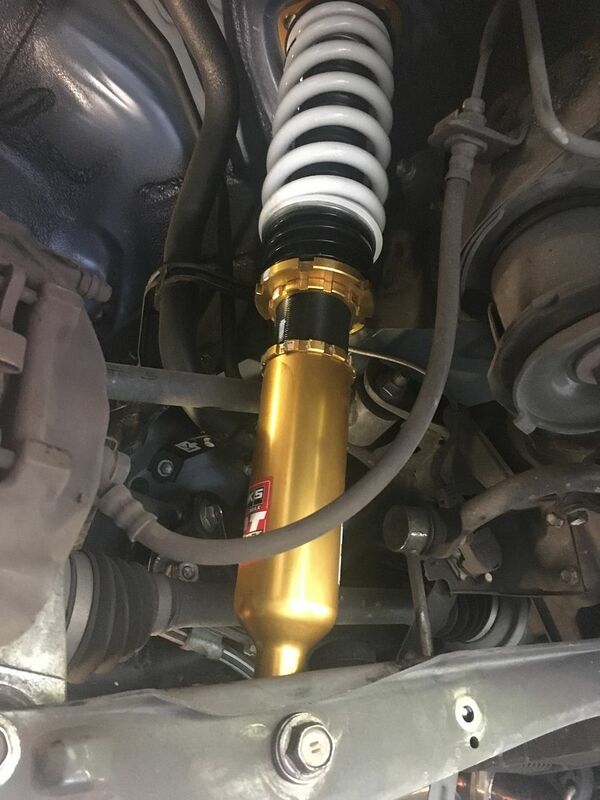 I'd had a really good experience with the Aragosta Comfort-spec coilovers in my old FD, which were the base-model Aragostas. 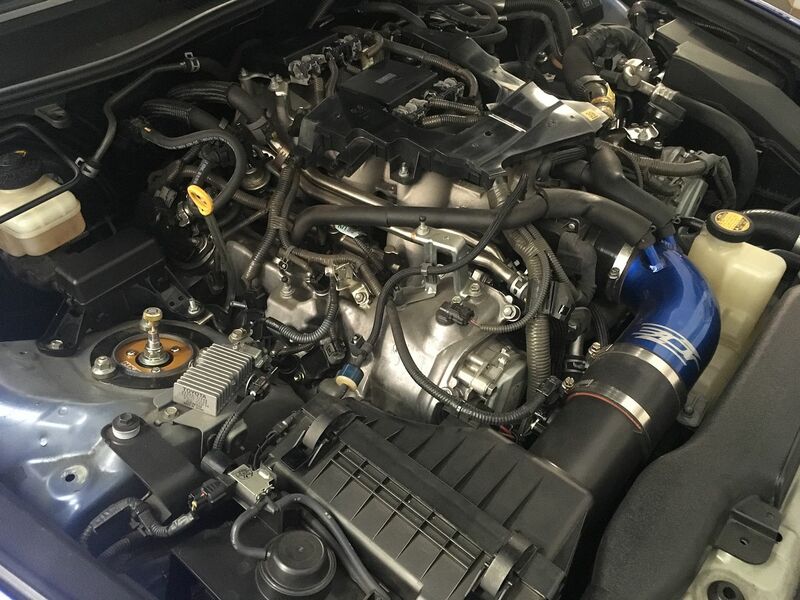 But their ISF range only starts near the top of the line with the Type-SS, and with the current exchange rate these would have been around $4500. 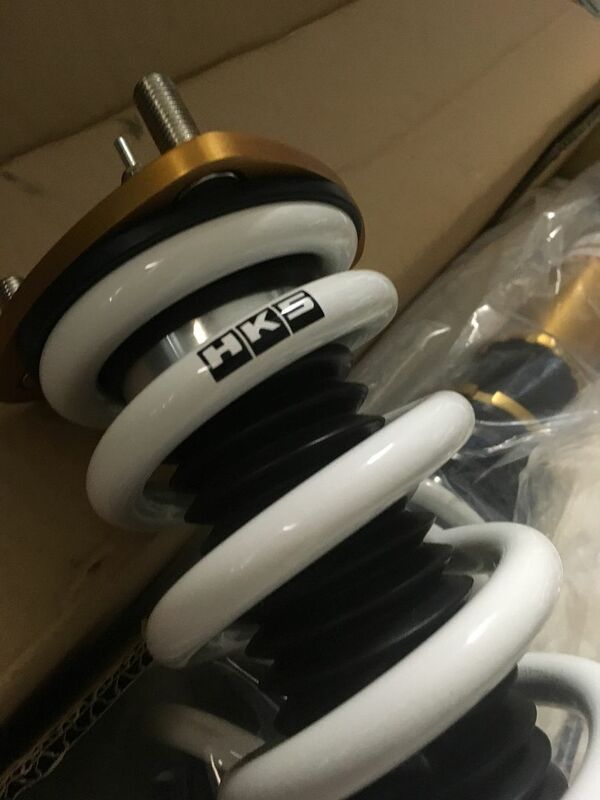 So for about half the price, the HKS ones seem like they'd be worth a try, especially since they'd received generally very positive reviews on Clublexus. I decided to do the swap on that 37C hot day last Friday, so if there are fewer pics than my usual standard, it's because my motivation started to decline almost immediately First job is to remove everything in the boot. This might seem a bit of overkill, but the side panels over the shocks are very hard to remove unless you do. 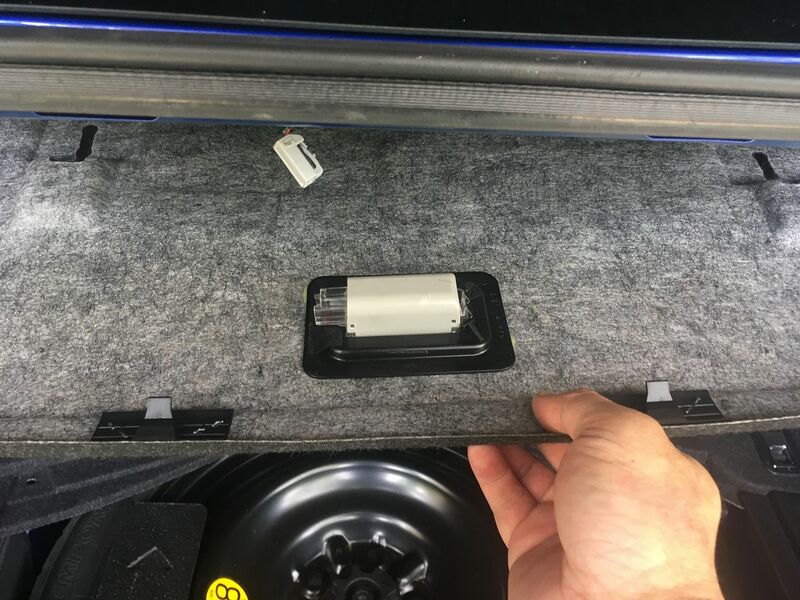 So the first step is to remove all the clips from the top panel of the boot, then pull it backwards to unclip it from the body, and undo the wire for the light. Then the whole top, back and floor covering all comes off in one big piece. Unbolt the 4 luggage tie down hooks, remove the 3 clips and give the rear garnish a sharp upwards tug to pop it off its clips. Then go around and remove the last few clips holding in the side trim panels. And now you can remove the last of the boot trim to expose the shock tops. 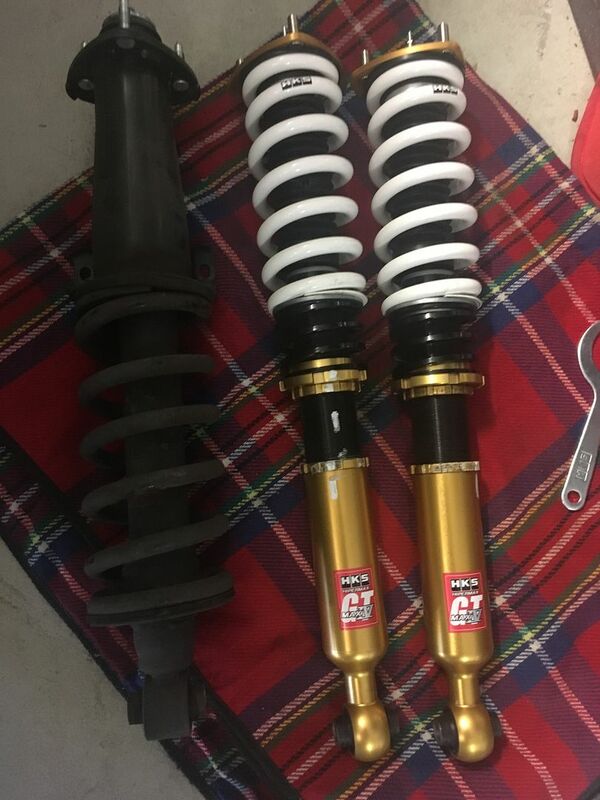 The next step might also seem like overkill, but it really does make it a lot less awkward to remove the old shock. Remove the zillions of clips and nuts and take out the guard liner. This exposes the whole top half of the shock. 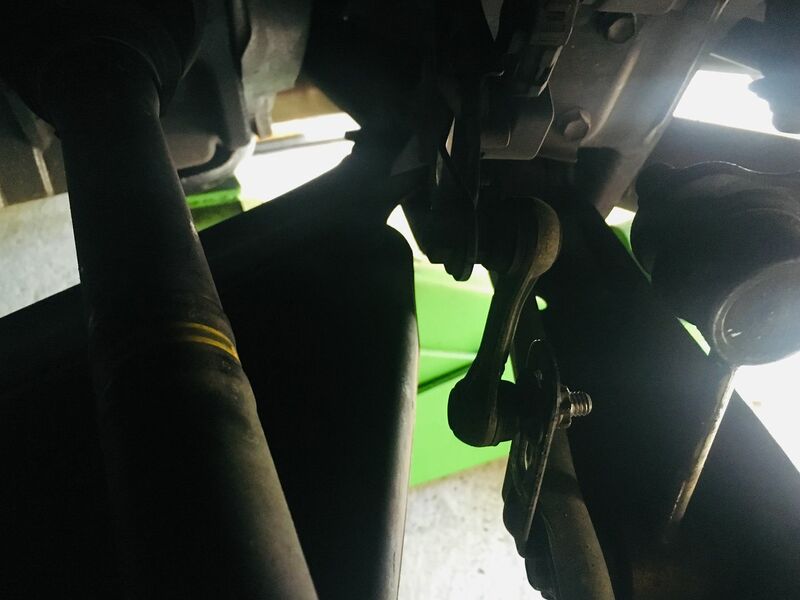 You'll notice that rather unusually, the shock is not only mounted at the top, but there are also two bolts that secure it to the side of the body too. The next part isn't so easy. 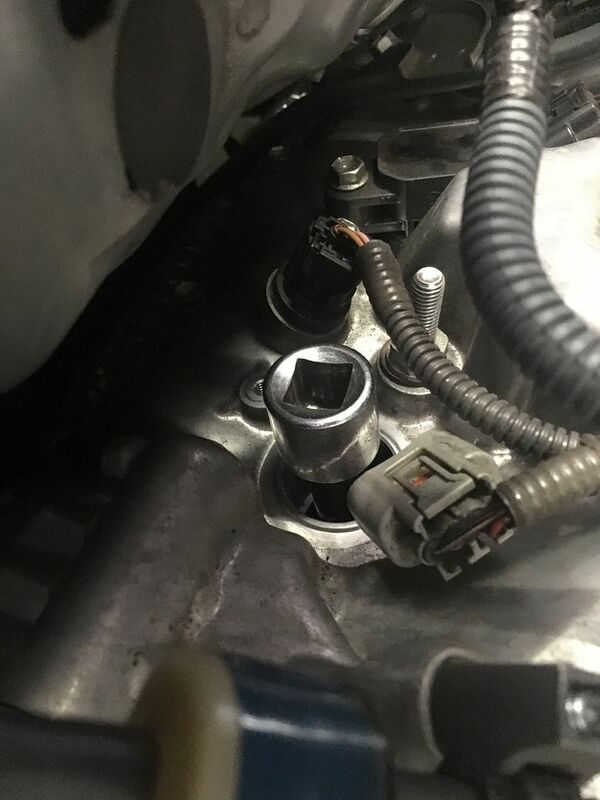 The outer bolt to the upright, the shock bolt and the away bar bolt all have to be removed. 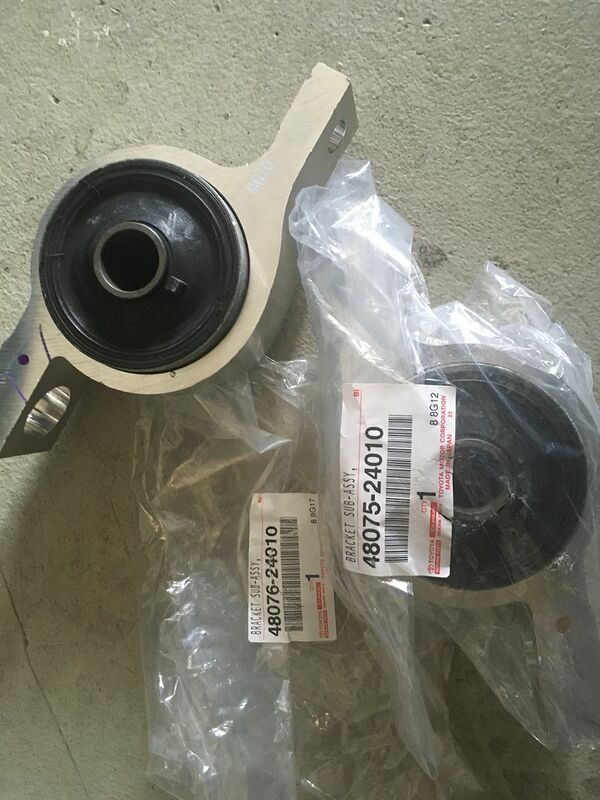 The reason why it's tricky is because the factory torque specs are incredibly tight. 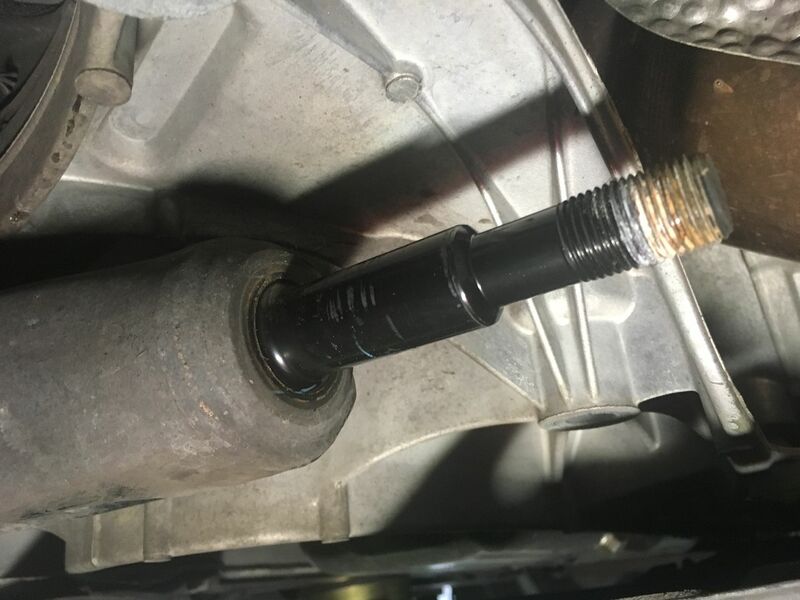 The shock bolt is done up to 165Nm, which is impossible to undo with a spanner, and you'll need to get creative with extension bars to get them off. 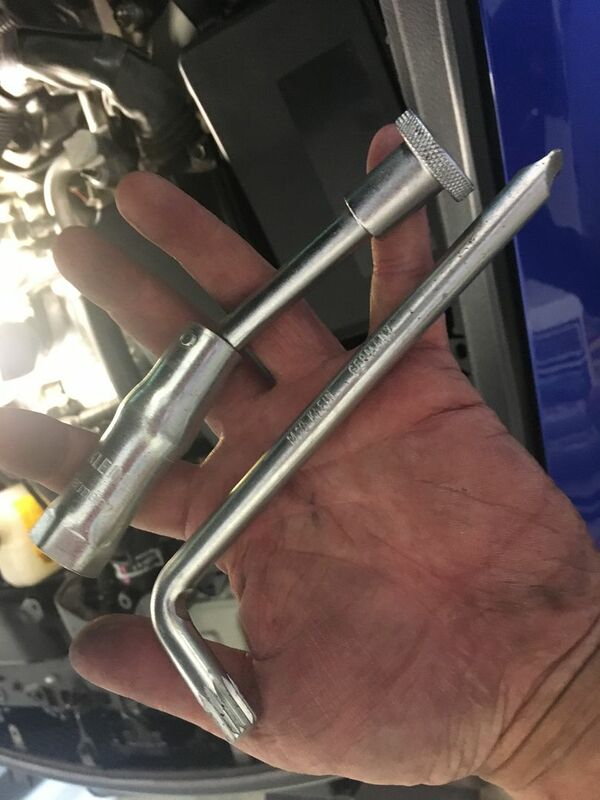 If you don't have the right combination of socket handle and long pipes (or jack handle!) then this is where you'll get stuck. 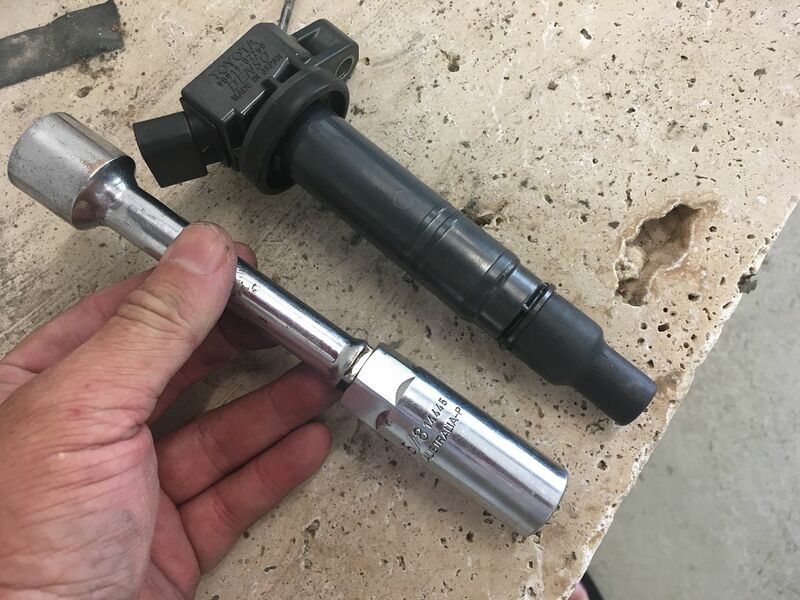 It'll help to have a second person on standby to lean on the extension bar, while you hold up the front to prevent the socket from slipping off and rounding off the bolt. 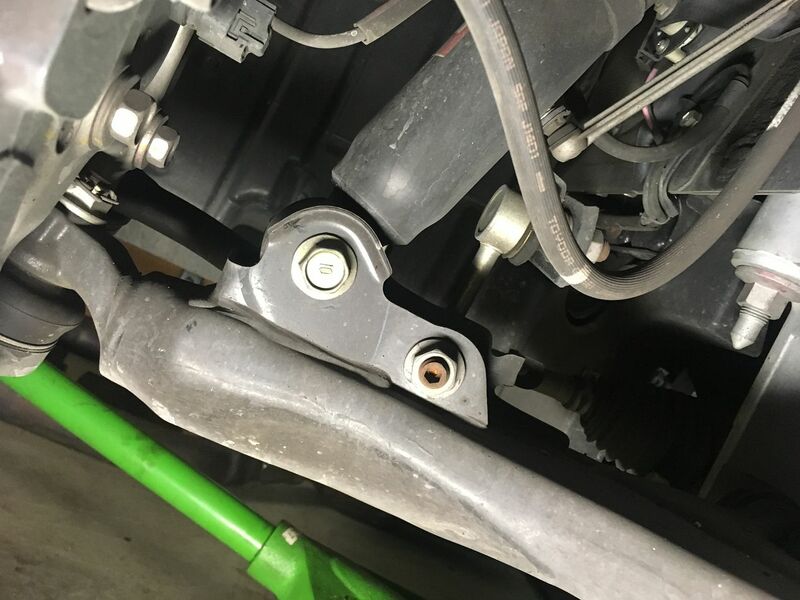 Rather unusually, you remove the bolt rather than the nut; the nut is actually keyed to little slots in the suspension arm (to prevent them from coming loose) so you loosen them from the bolt-side. 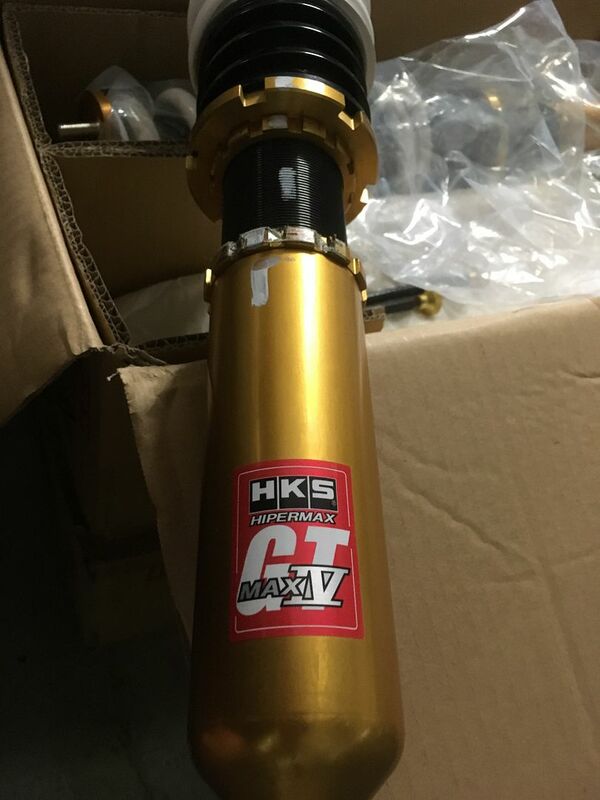 I'm installing the new shocks at the HKS factory specs, which will result in just a very modest drop in ride height. So that when you make a hole in the side trim, the adjusters can poke through. 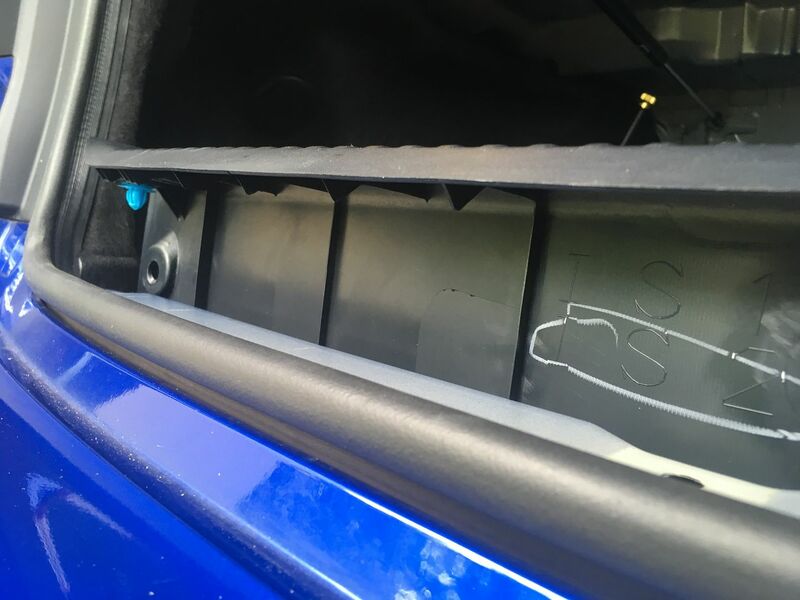 To make the hole, I'd marked the spot with a pen before removing the boot trim. 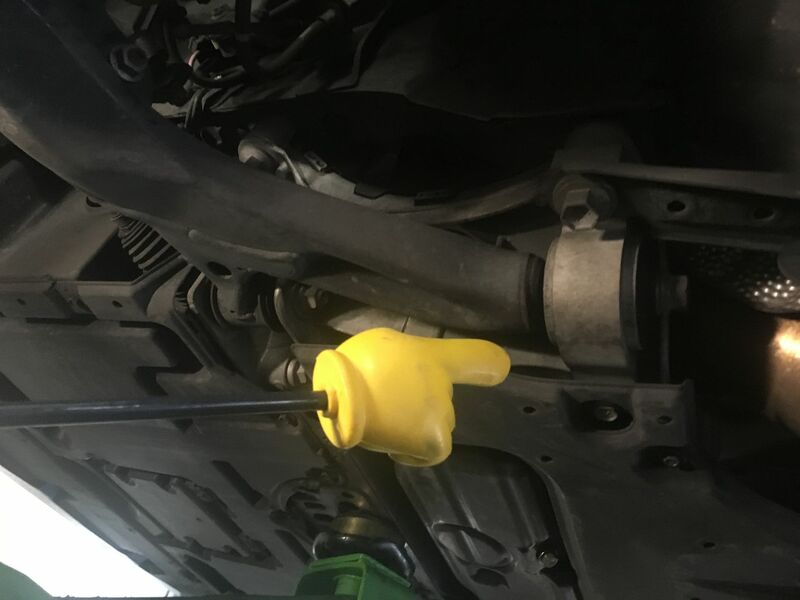 The top of the stock shock is just a few mm below the trim, so if you felt around with your fingers, you could tell where the right spot was. 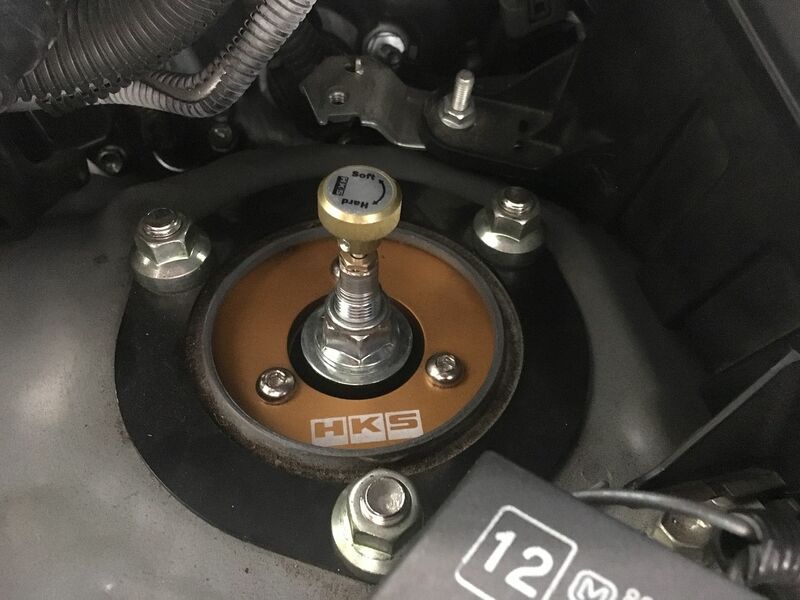 The HKS instructions are great, there is an English language section with torque specs and everything: do up the lower arm bolts to the insane 160Nm for the upright and 110Nm for the shock bolt. 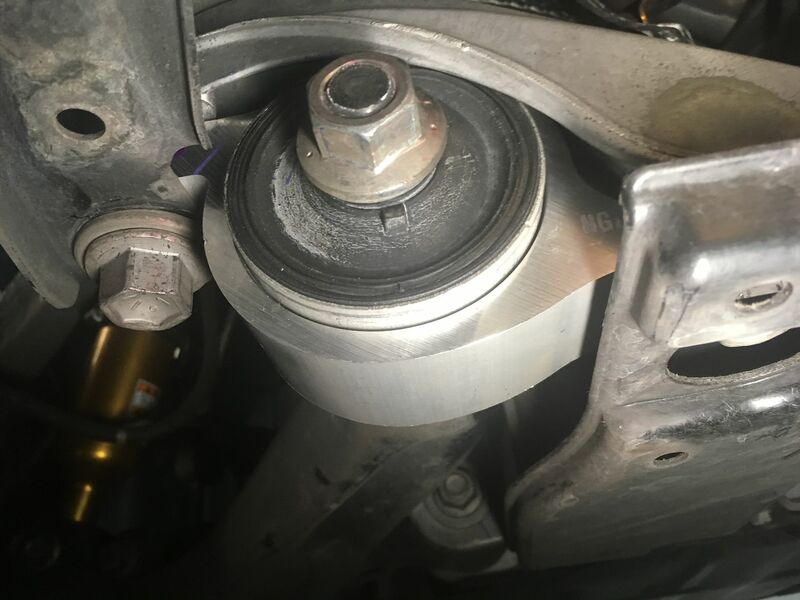 Oh lastly, make sure you bolt the ride height sensor like this: with the linkage coming off the suspension pointing upwards. 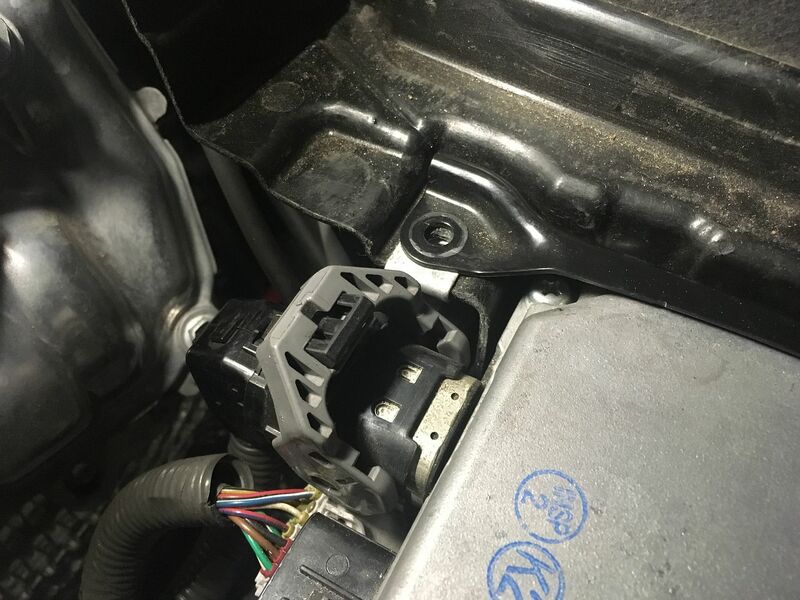 There are ride height sensors front and rear, they are for headlight auto-levelling, and it's possible to reattach it with it facing downwards, and you'll get a 'Check Headlight System' warning light as the car spazzes out about why the rear suspension is at a catastrophically weird angle. Now that the rear is all done, you can start on the front. Then you'll have to use a balljoint separator to split the wishbones. This is because the shock is trapped inside the wishbones and is too fat to be wiggled out without making some extra room. 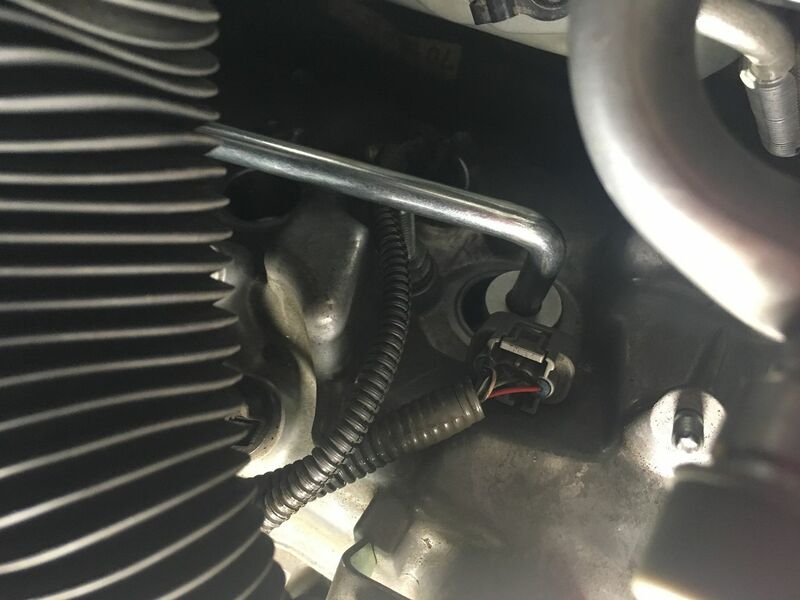 But once the shock is out, it just takes a few minutes to slot in the new one, not forgetting to bolt up the ABS line bracket to an adjustable bracket that's held in place with a hose clamp on the HKS shock. And we're done! The fronts take maybe only a 1/3 of teh time it takes the rears, and it was about 4hrs from go to whoa. 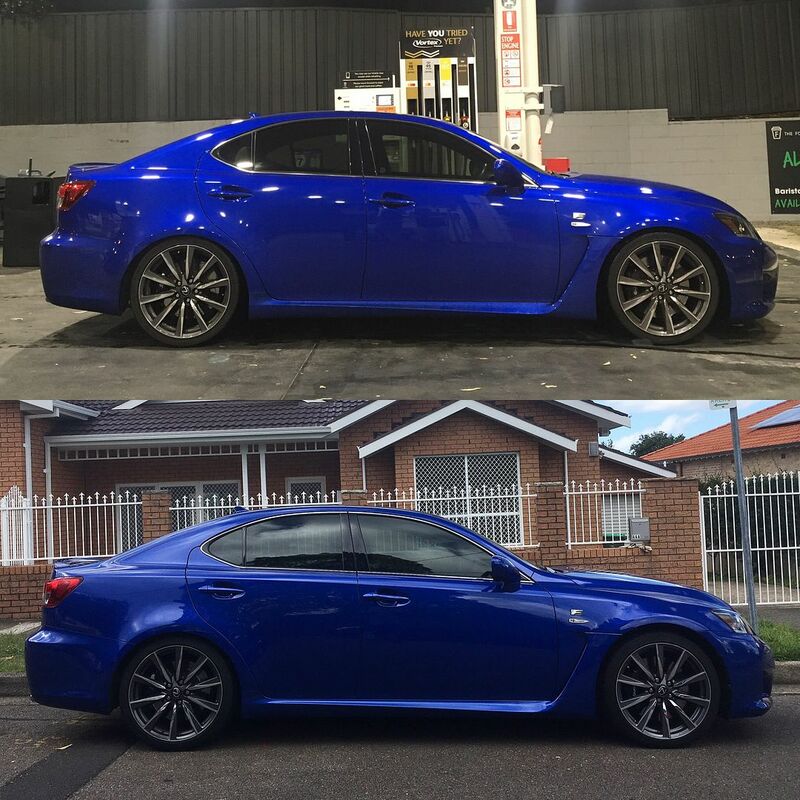 The resulting new ride height is a 10mm drop at the rear and a 18mm drop at the front. I think it looks just nice, without being too slammed. In terms of ride, it makes a great first impression. All ISFs have this very taut, firm quality to the ride with lots of small, sharp vertical movements, even on a smooth road. 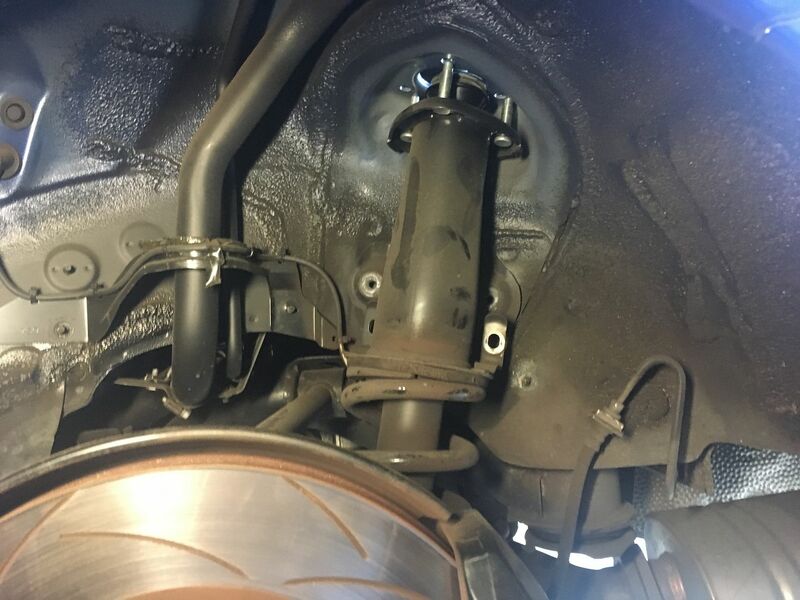 The new shocks to feel ultimately stiffer, it corners flatter and when you hit actual bumps or speedhumps, you can tell that the suspension movement is a lot less and body movement is more severely checked. But compared to the stock setup, it's much more serene more of the time. At full-stiff, it feels about as jiggly as the stock setup, and from full-soft to full-hard, there are 30 laborious clicks of the adjuster, but not really a game-changing difference in feel. Certainly you won't feel 2 clicks and would struggle to feel 5. 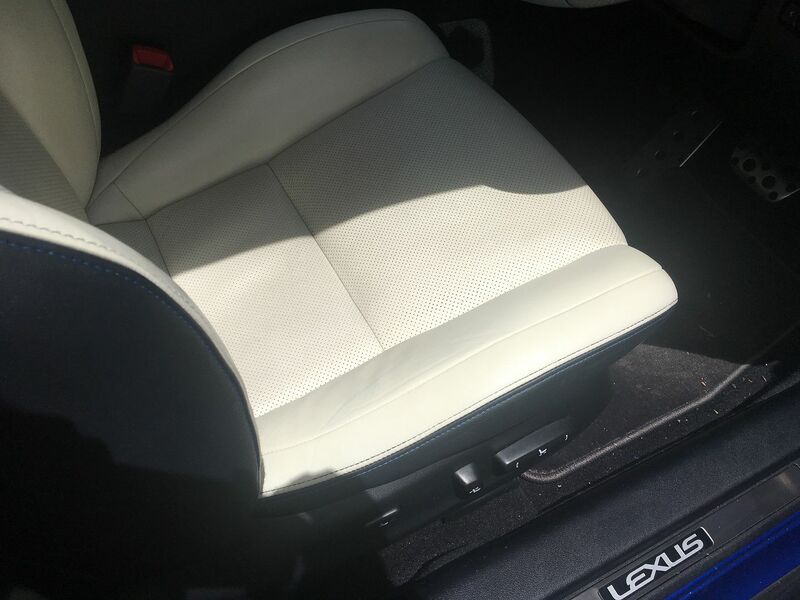 As for why the stock suspension feels that way; I suspect that Lexus was aiming for a "signature" F chassis feel. The stock setup is actually conventionally soft, it absorbs big bumps well and on track it rolls heavily onto the outside front wheel. But the rest of the time it has an overly-taut feeling, where it reacts to the tiniest little surface change. 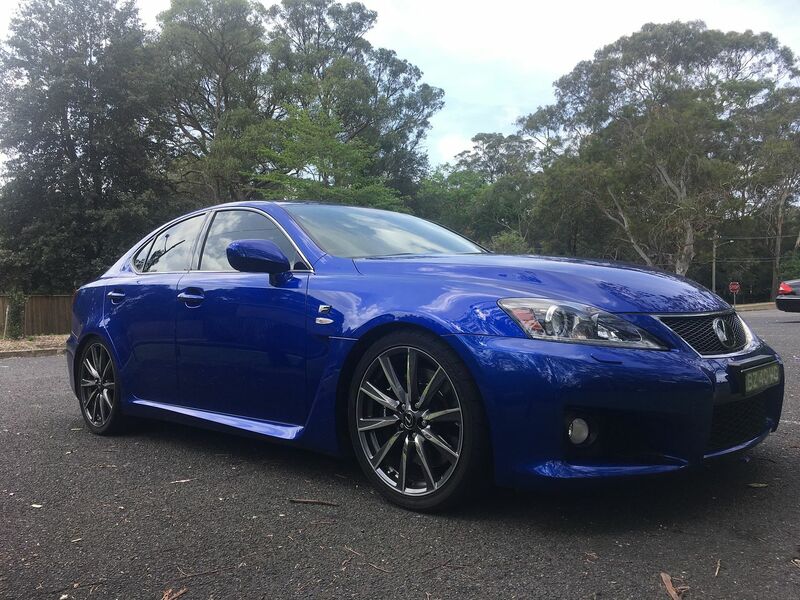 I think that's the feel that Lexus was going for, where it feels like the suspension hasn't got any slack in it at all; and the car feels hyper-alert and communicative. 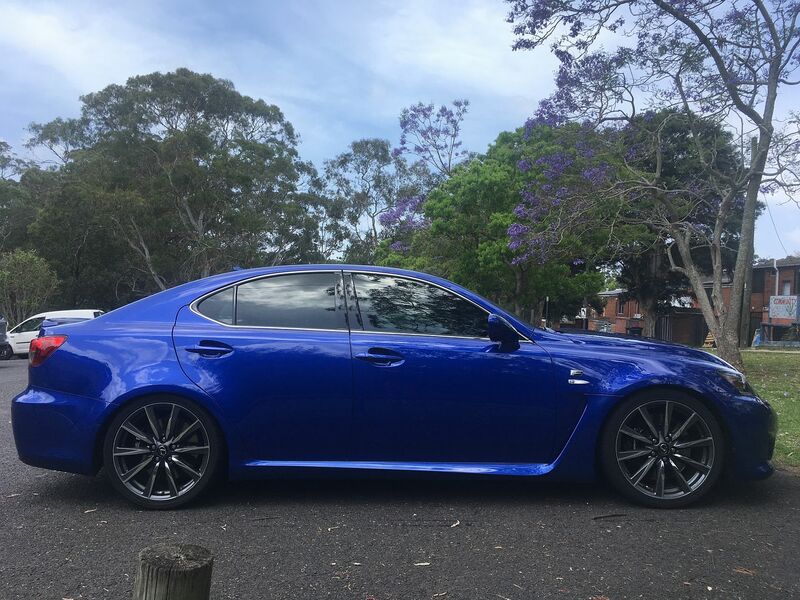 And Lexus did do a good job of retaining this character as each version of the ISF got more comfortable. On the new suspension I do have to say that it feels a little bit lazier dynamically, as if you have to turn the wheel more to get it into a corner. It's all in the head though, and the flatter, firmer new cornering stance should bring dividends in laptime. I guess we'll have to see but at the moment I am enjoying the more refined and expensive feeling new ride quality and subtle amount of slam. Now that we have nice suspension, I figured I'd fit some parts that I bought ages ago. 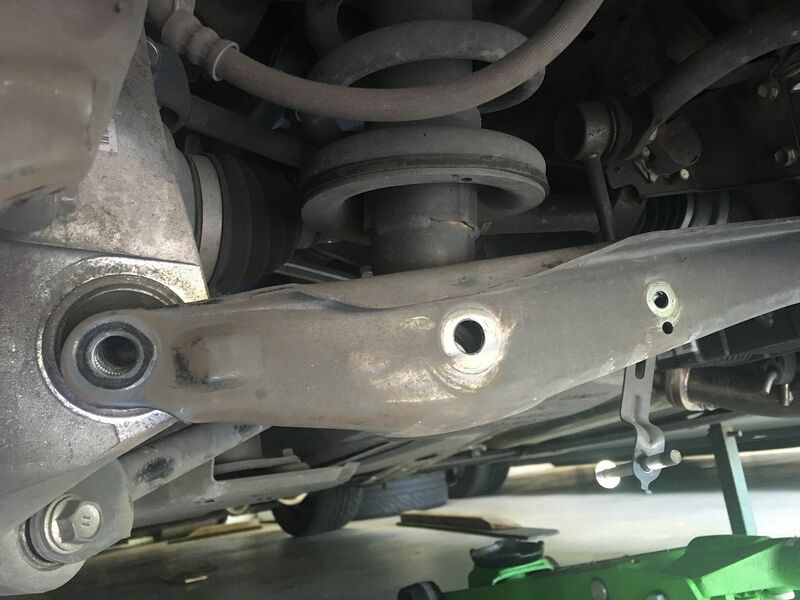 They're lower wishbone bushes from the RCF. 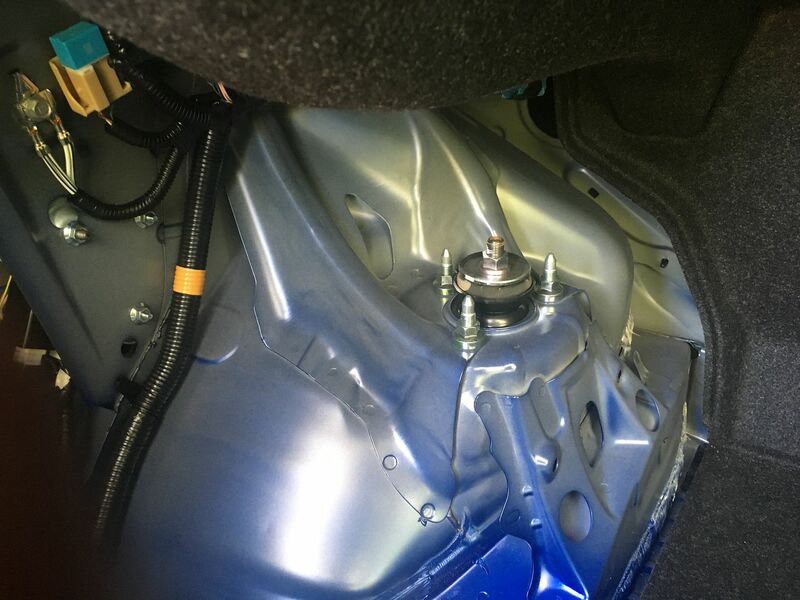 The ISF has these huge rubber bushes which are the size of your fist, and while they're an upgrade from the regular IS250/350, when Lexus released the RCF, they made the bushes stiffer again. 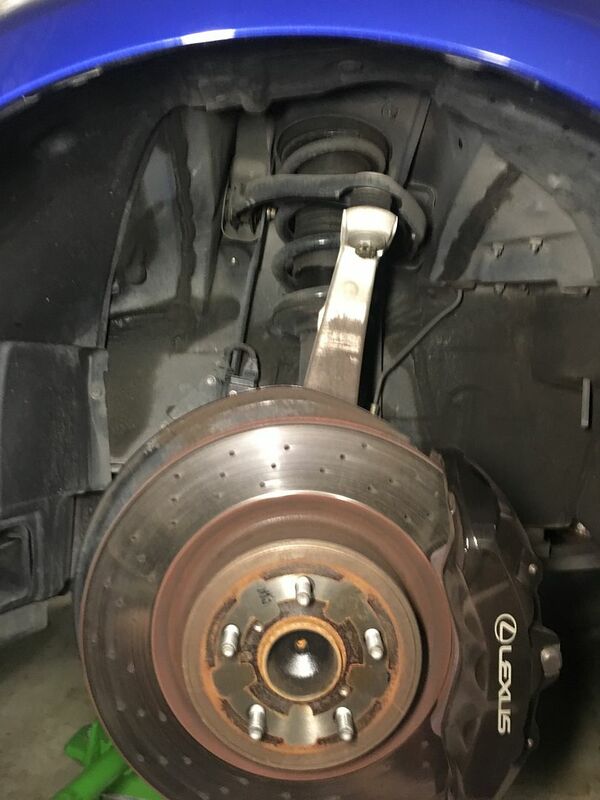 They go back here, at the rear of the lower front wishbones, and the big rubber element provides a lot of cushy fore-aft movement to absorb bumps, but it also has a contribution to the front toe control as the wishbone moves around within the rubber. To replace them is quite simple. 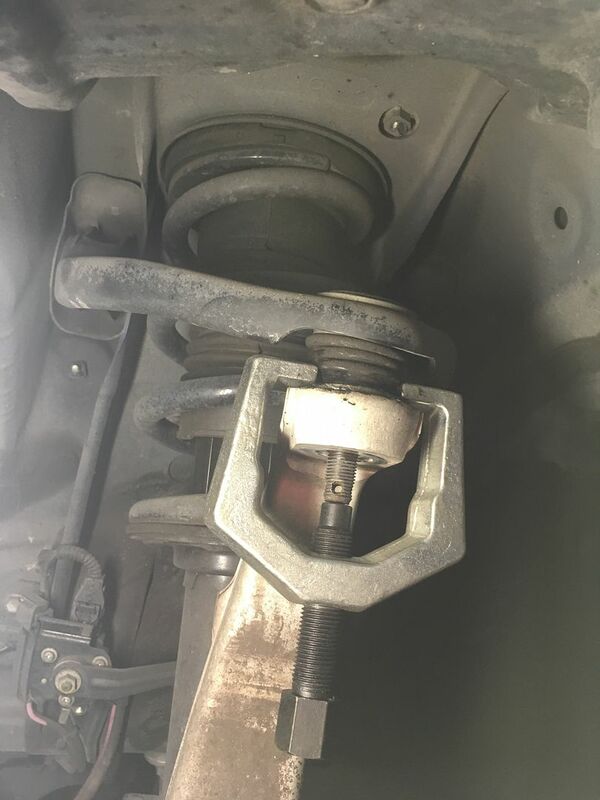 Just undo all the bolts holding it on, and it would pretty much just slide right off, if it weren't for this protruding lip on the crossmember casting. To get around this, you can use a big screwdriver, pry bar or the handle of a socket breaker bar, as I'm doing here. 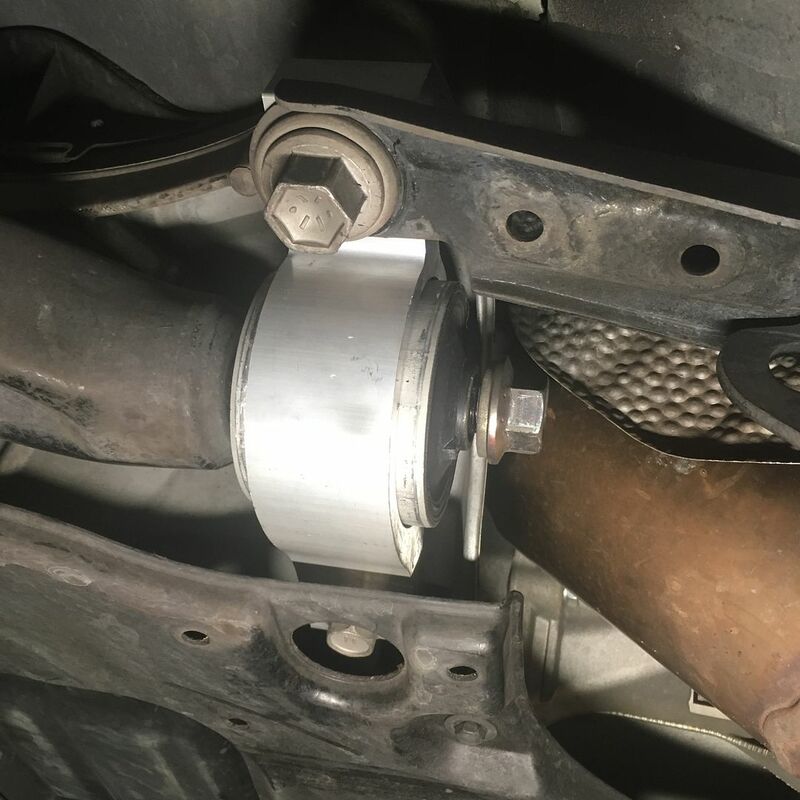 There's plenty of flex, so you can just lever down the wishbone enough to slide off the old bushing. ...to match the shaft on the wishbone. 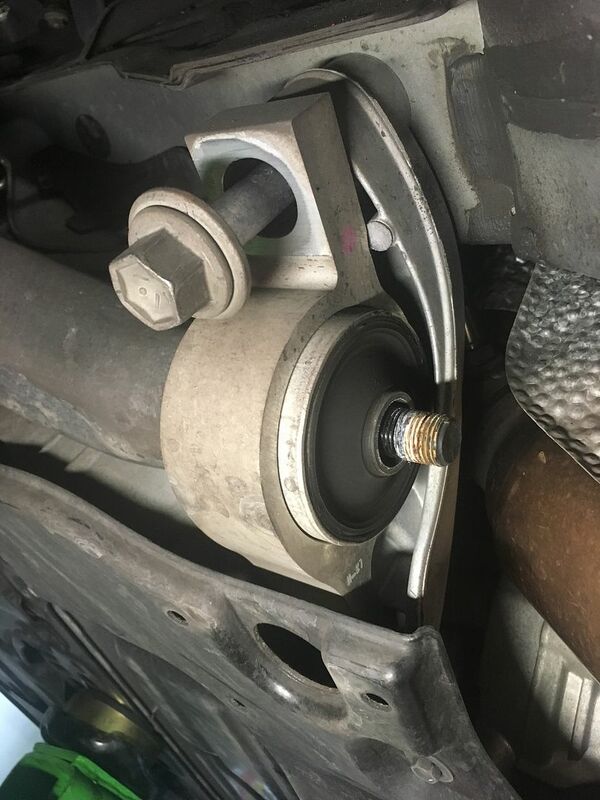 But the new bush slides on easily enough...but I leave the wishbone nut a bit loose. 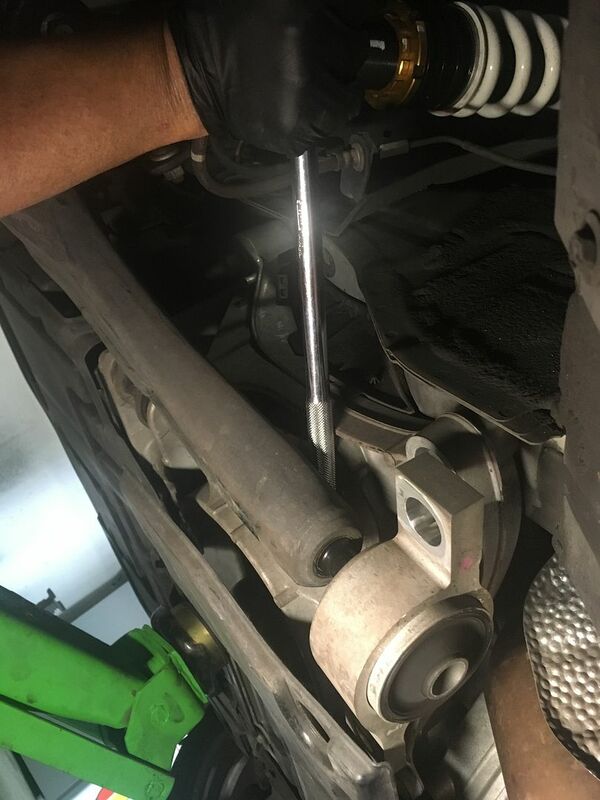 Jack up the suspension so that the wishbone is roughly in the same spot as normal ride height, and then tighten the wishbone nut. 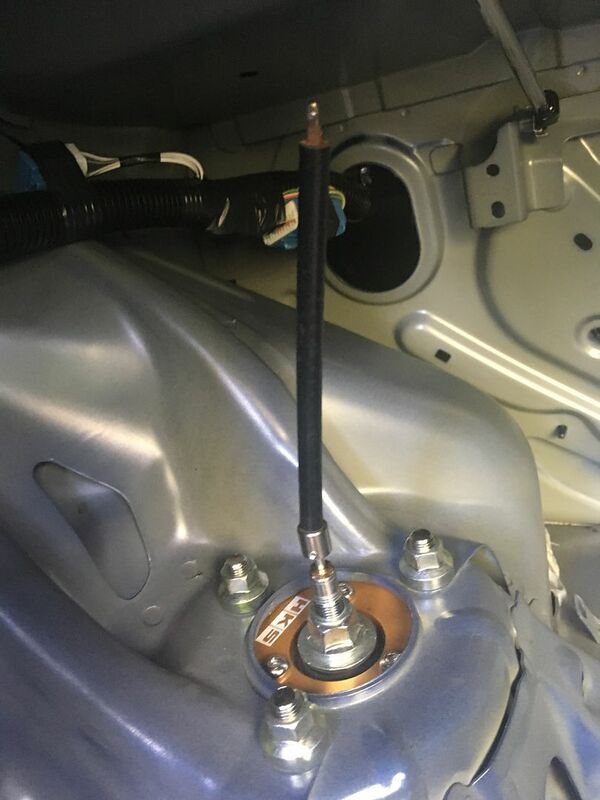 This means that at normal ride height, the rubber element isn't twisted. 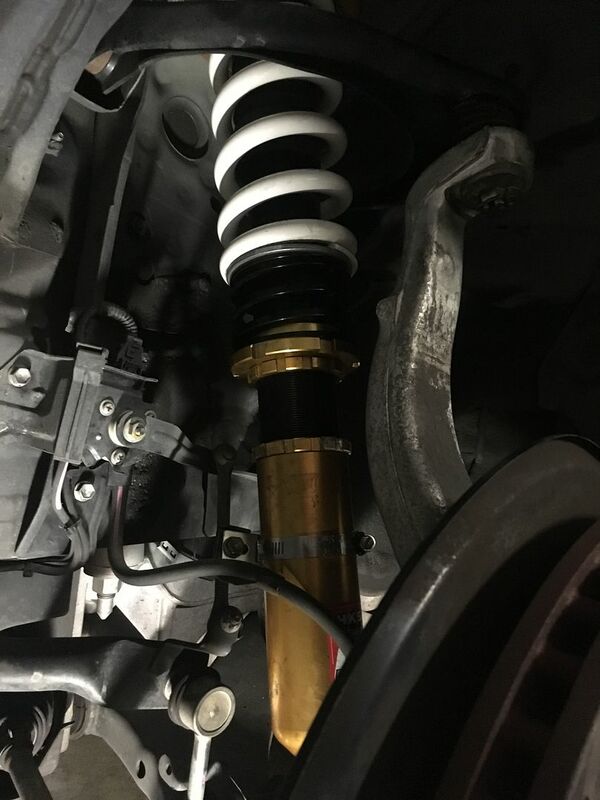 If we'd bolted it up with the suspension at full droop, the rubber would be a little twisted when it's at normal ride height, and it'll wear out quicker. And how much stiffer is it? 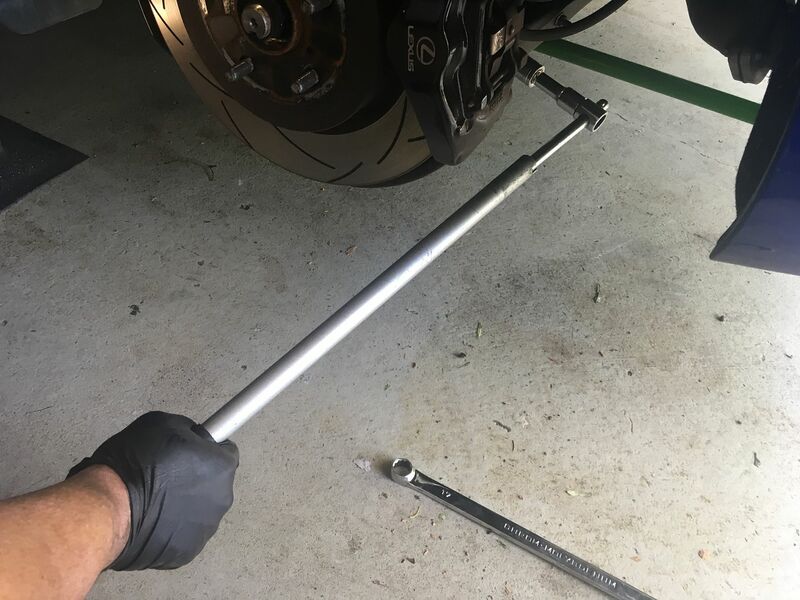 Well I decided to test it by clamping the bush in a vice, then using a breaker bar to see how much deflection there is, using the highly-accurate and totally-scientific Torque Arm device. And...well surprisingly the difference was very noticeable. 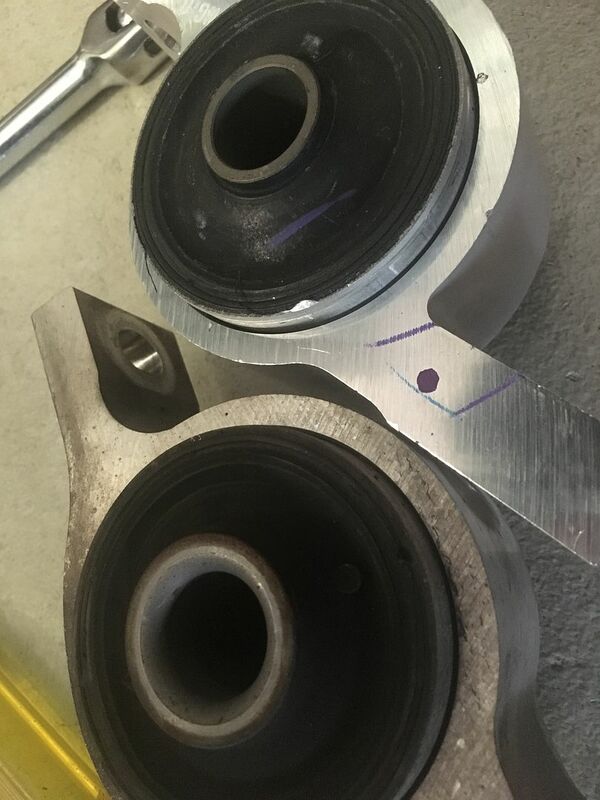 It didn't take much strength to deflect the ISF bushing 7-8mm, but it took considerably more effort to deflect the RCF one half as much. 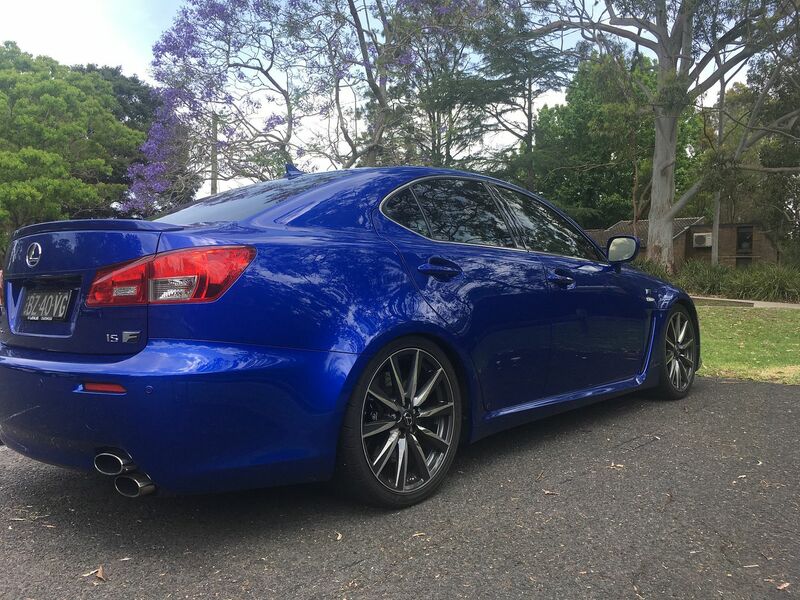 But to be honest, all this proves is that a brand new RCF bush is a lot stiffer than a 74,000km old ISF bush. 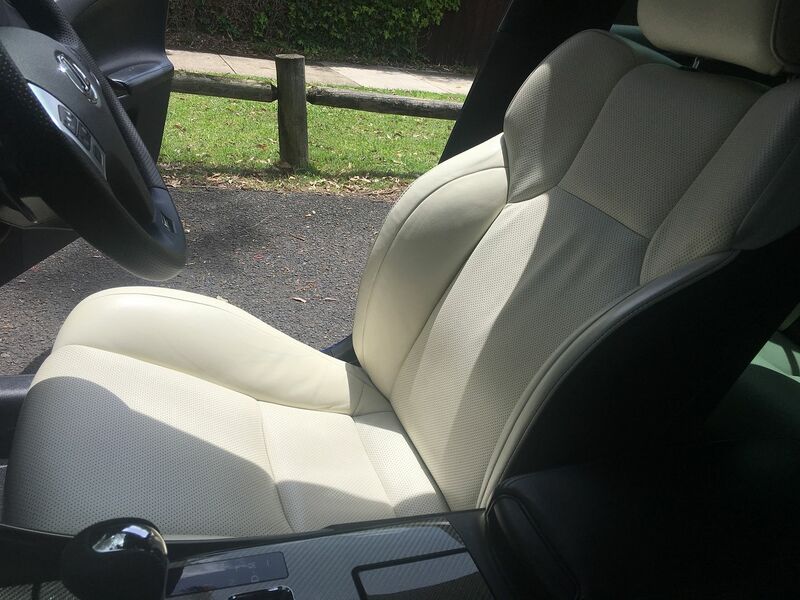 But stiffer is stiffer, and the steering does feel noticeably tighter and with a crisper feel just off centre. 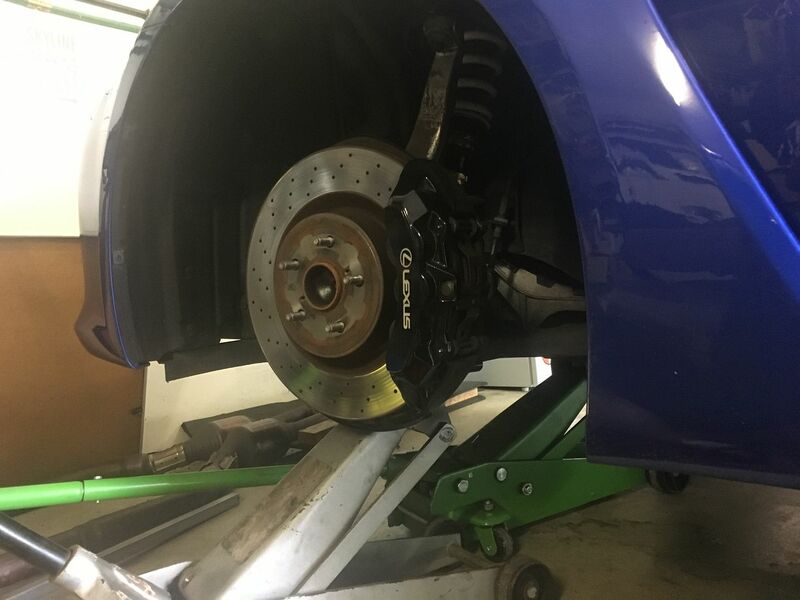 After a wheel alignment, it looks like we have just a tick over 2 degrees of camber all round at the current lowered ride height, so this should hopefully translate to better tyre wear on the track. 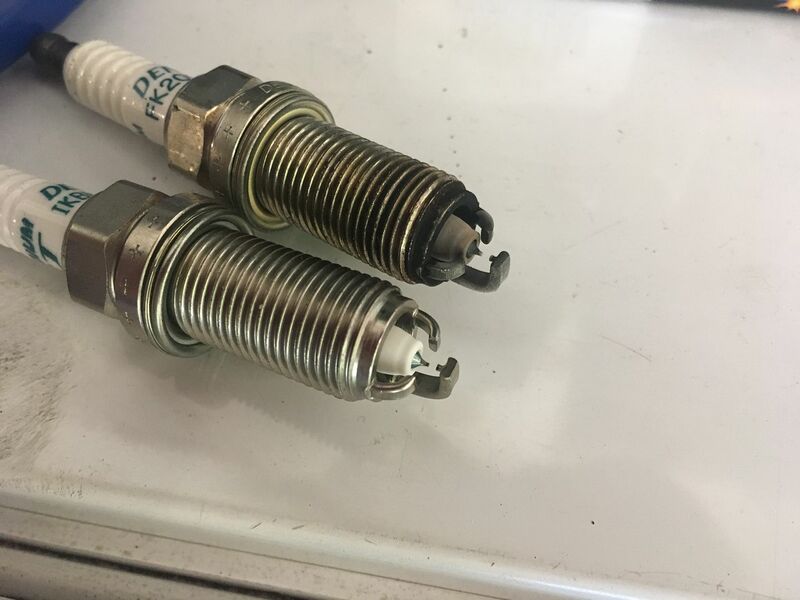 The other thing I did recently was to swap out spark plugs. 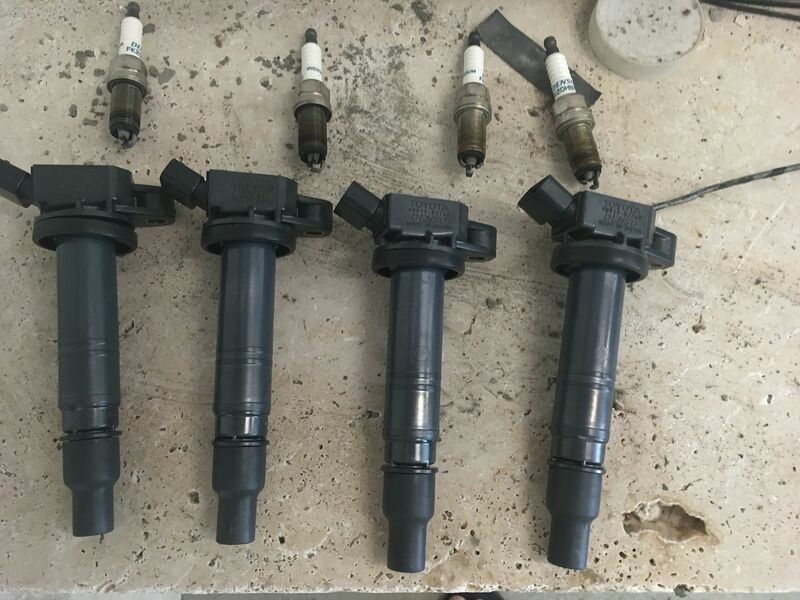 Std service interval is 100,000kms, so they have 26,000km to go before they need to be replaced, but hey why not. 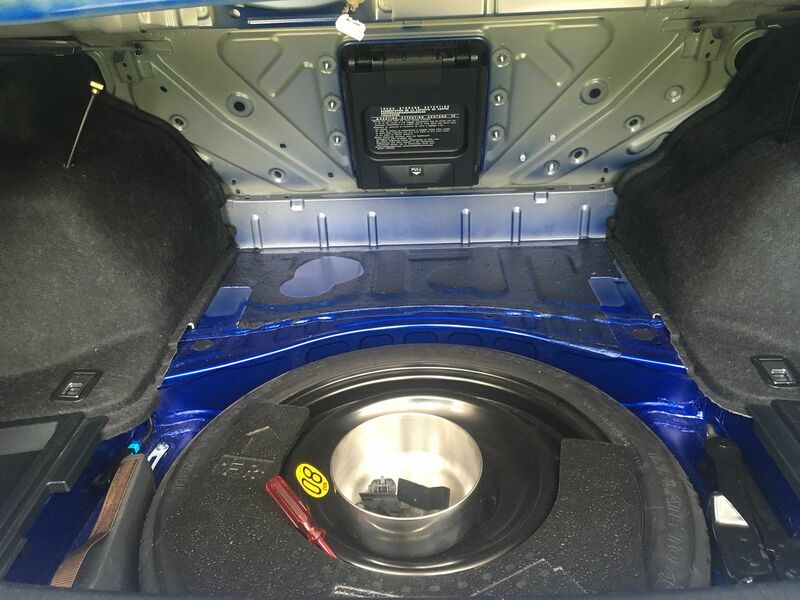 But unfortunately this wasn't easy...the spark plugs are in there...somewhere. 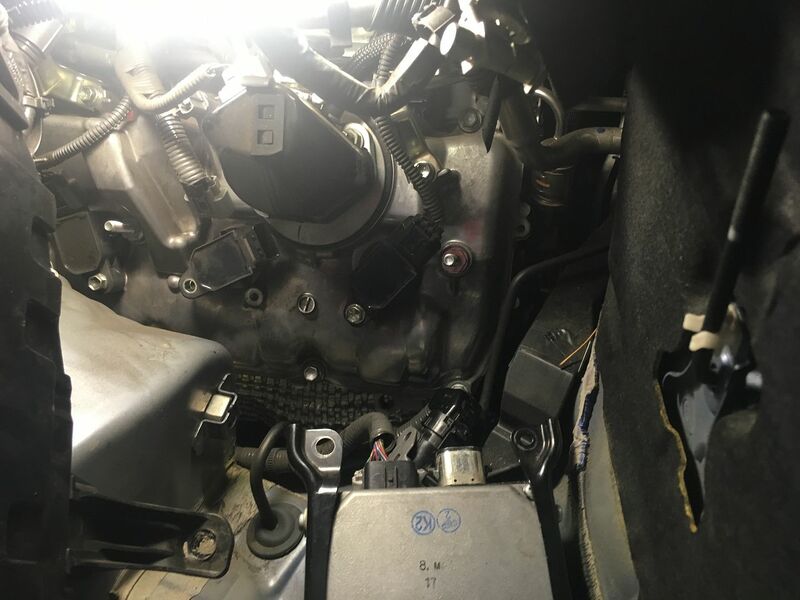 The challenge is that half of the plugs are really hard to reach, and require a whole bunch of engine bay furniture to be unbolted and moved in order to make space for the spark plug tool. 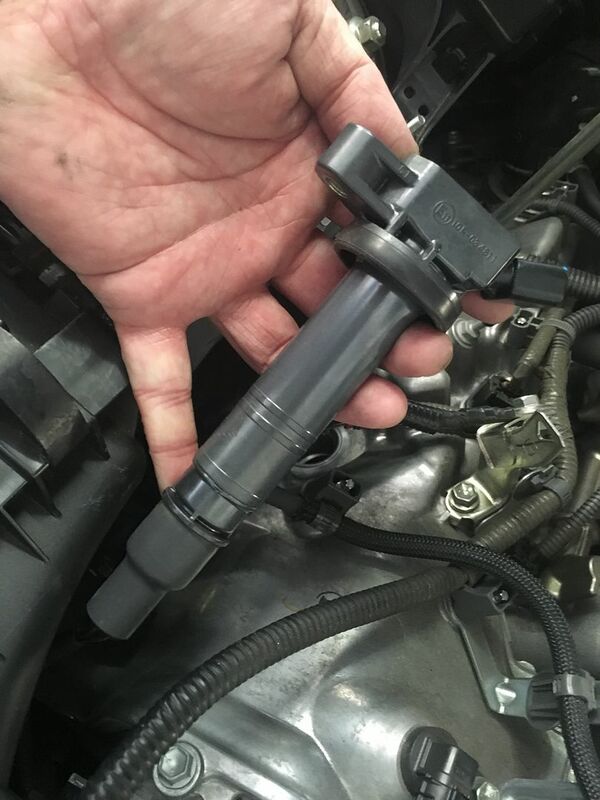 And protruded from the spark plug hole at just the right height to allow the socket handle to swing. 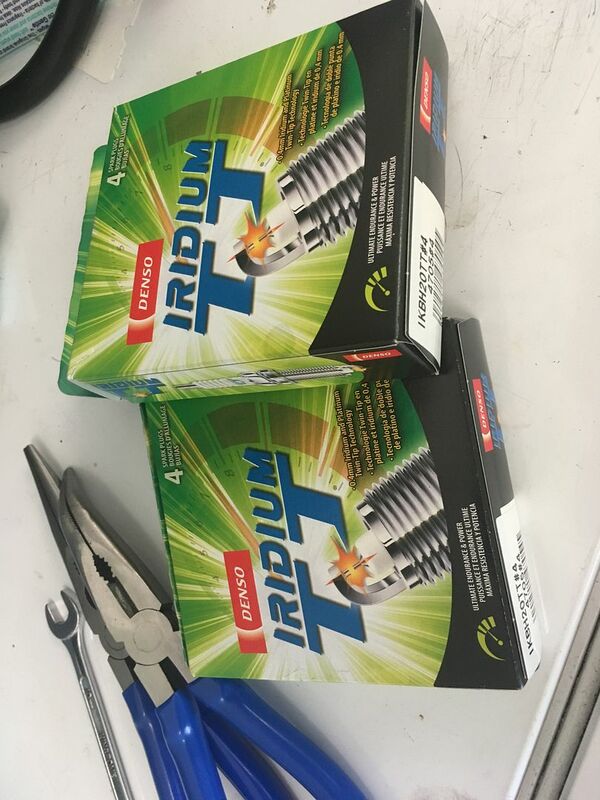 New versus old Iridium plugs. The old ones visibly seem to have a larger electrode gap from wear, but they aren't too bad. 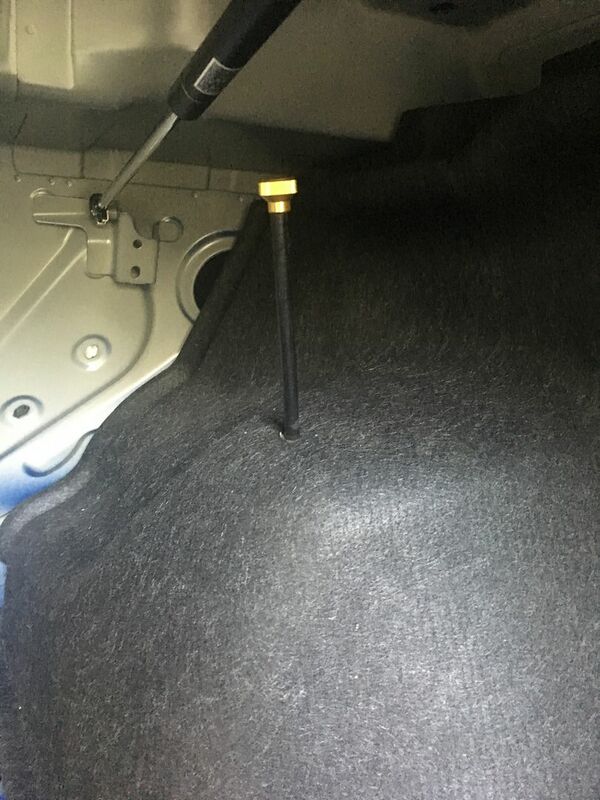 It took about 45mins to do all 4 plugs on the driver's side, which is the "easy side". The passenger side is a bit more involved, and it's impossible to do the 2 rearmost plugs unless you remove the battery box. 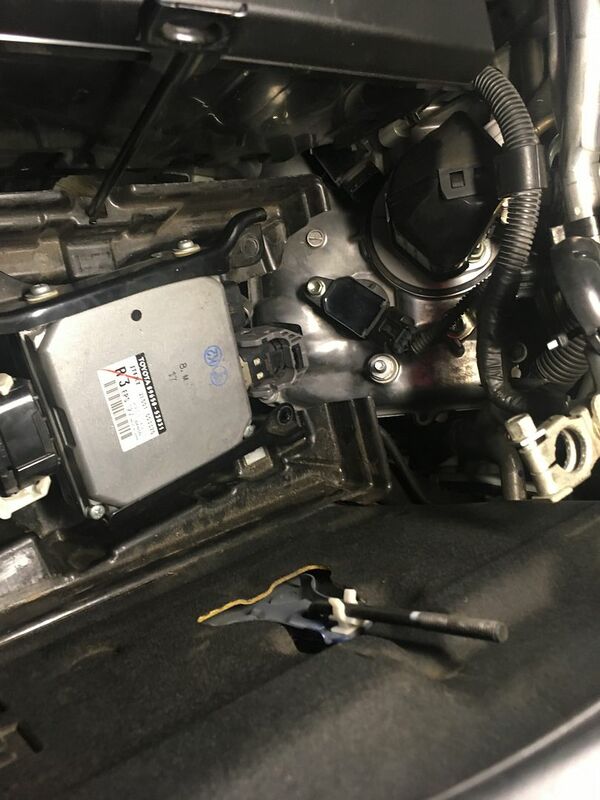 Once you do that, you see the electric power steering ecu underneath, which also needs to be moved aside to access the battery tray bolts. 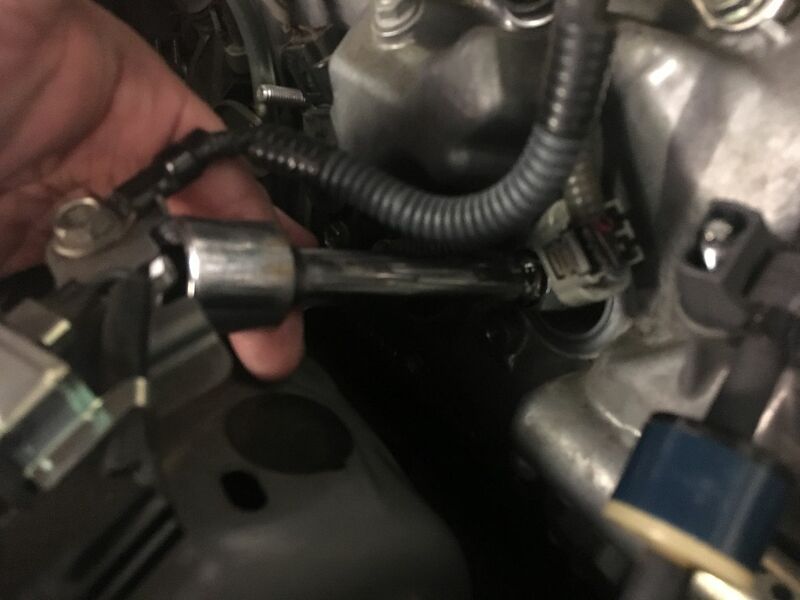 The EPAS ecu has these funky double-action connector locks...first you use a little screwdriver to prise out that little black tab, then you flip back the U-shaped lock and the connector can be unplugged. 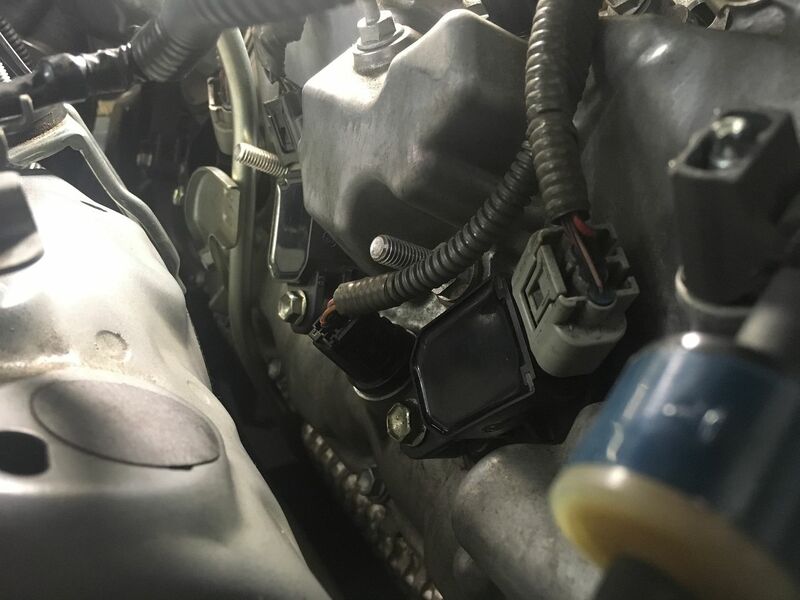 Unplug one side of the EPAS ecu, flip it up and you can unbolt and remove the battery tray. And now, the two most inaccessible plugs are now surrounded by a rather luxurious amount of space. 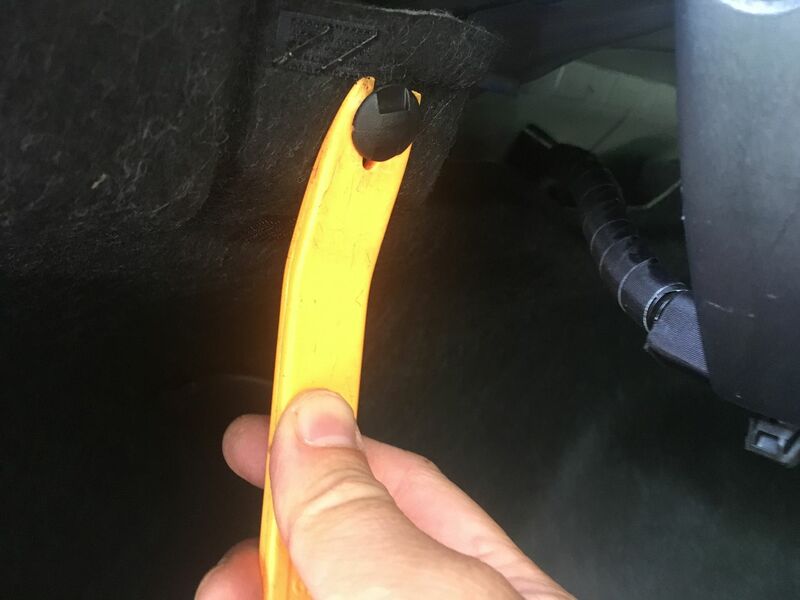 Ironically, I thought the frontmost plug on the passenger-side would be easy, but the aircon hardlines were in the way, and it was impossible to get the spark plug tool in there. 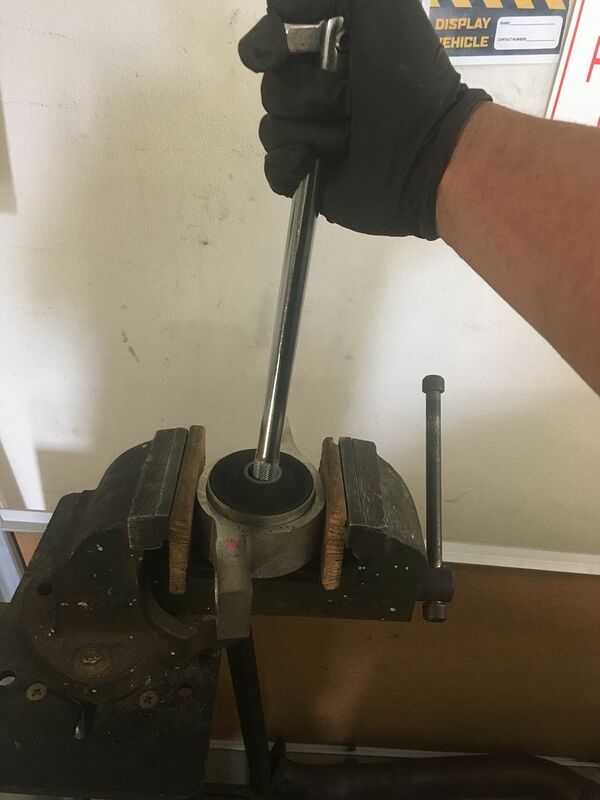 So I found this, an old Porsche plug tool, which has a bendy bit in the middle and could just about be wiggled into place. 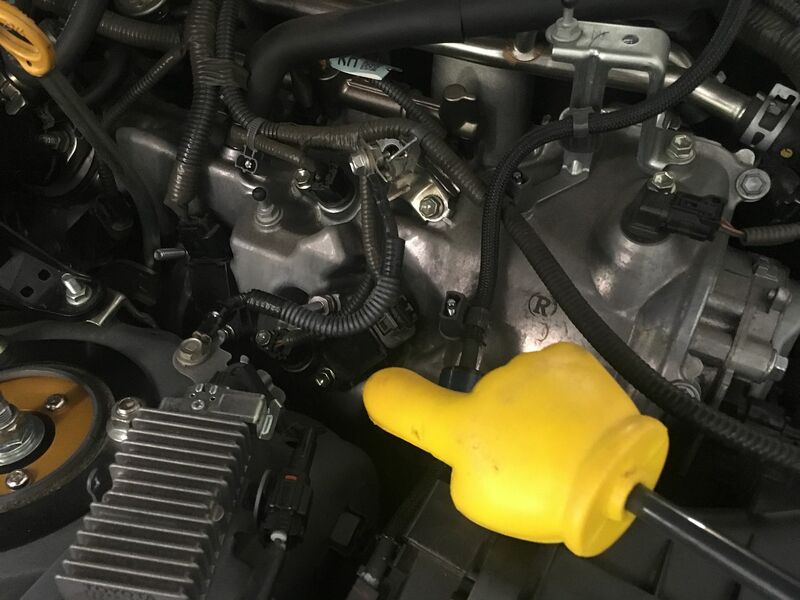 And with that last one done, start the engine, and it'll cough and immediately stall. Which is supposed to happen when the ecu has been reset (because the battery was unplugged for a few hours). Start it again, and let it idle for a bit while all the systems boot up and do their thing.